Few sounds are more annoying in the middle of the night than the fine harmonic resonance of the cricket, rubbing his wings together. Males chirp and attract females by rubbing a scraper on the inner edge of the left wing against the teeth of a file beneath the right wing. Outside, crickets are attracted to bluish electric lights and can often be seen swarming near them in large numbers. They feed on plants and dead or live insects, including other crickets. Crickets often enter houses to escape from either the extreme heat or extreme cold. These pesky insects are nocturnal and usually hide in dark, warm places during the day. They can commonly be found wherever there is clutter. 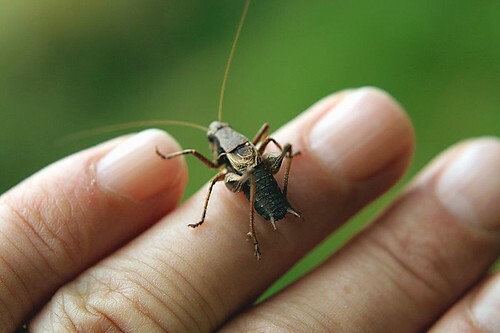 When crickets find their way inside homes, they can damage clothing, carpeting, and other fabrics, including wool, cotton, silk, and synthetics. They can eat through large areas of fabric, and are especially attracted to clothes soiled with perspiration. Keep all areas around your home clean and free of build-up of leaves, and dead brush. Apply granules in a 2-5 foot barrier around your home. Be sure to water them upon the first application. Apply spray outside to door frames, eaves, complete garage, and sides of home. Apply spray inside on all baseboards, closets, and every room. By routinely treating the outside of your house and reducing clutter, you’ll be sure to discourage all pests from bugging you!